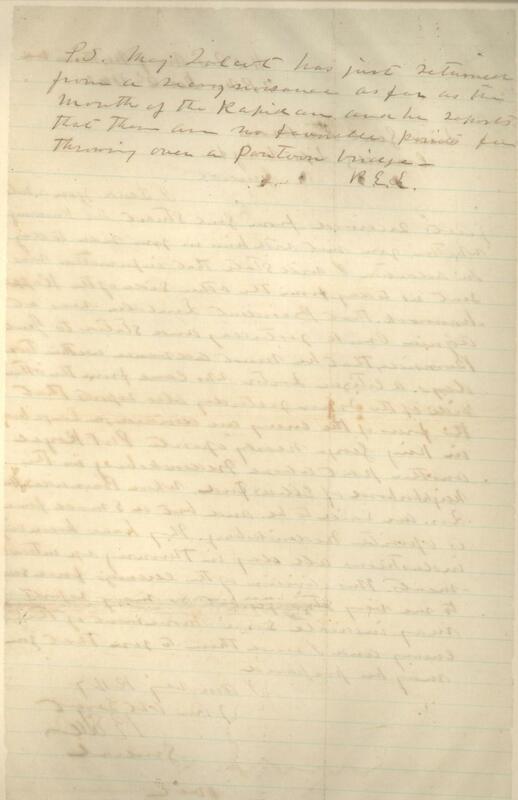 Item description: Letter, 2 December 1862, from Robert E. Lee to Thomas J. “Stonewall” Jackson. Item citation: From folder 248 in the Charles William Dabney Papers #1412 in the Southern Historical Collection, University of North Carolina at Chapel Hill. Hd Qrs. Army Northern Va. I send you a note just received from Genl. Stuart. Not knowing whether you met with him in side today. In addition I will state that information was sent us today from the other side of the Rappahannock that President Lincoln was at Aquia Creek yesterday and stated to Genl. Burnside, that he must advance within two days. A citizen doctor who came from the other side of the river yesterday also reports that the forces of the enemy are divided, a large body in King George nearly opposite Port Royal another part above Fredericksburg in the neighborhood of Ellis’s Ford. Where Burnside’s Hd. Qrs. are said to be. And but a small force is opposite Fredericksburg. They have been very industrious all day in throwing up entrenchments. This division of the enemy’s force seem to me very strange, but so many reports may indicate some movement of the enemy and I send them to you that you may be prepared. P.S. Maj. Talcott has just returned from a reconnaissance as far as the mouth of the Rapidan and he reports that there are no favorable points for over a pontoon bridge. 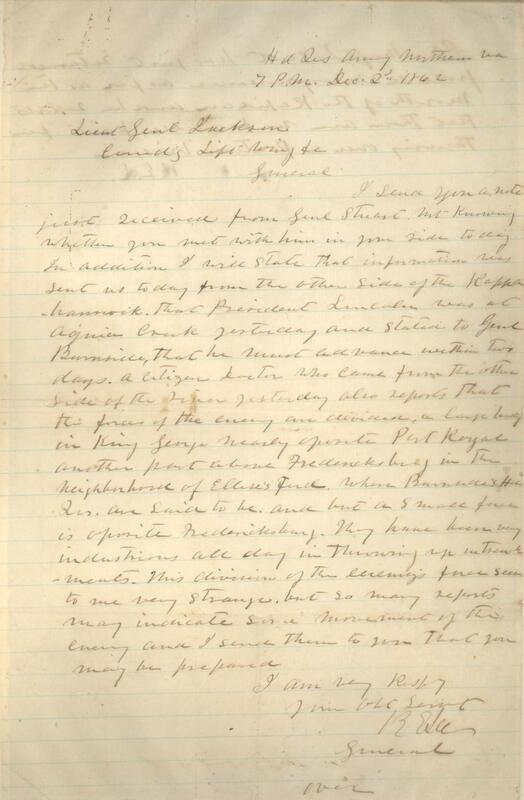 This entry was posted in Southern Historical Collection and tagged Fredericksburg, Robert E. Lee, Stonewall Jackson. Bookmark the permalink.